This unusual word is usually translated as something like ‘conflict of opposites’ or ‘opposing forces’ which I consider are incorrect for several reasons. Firstly, in my view, a transliteration should be used instead of some translation, for the Greek expression suggests something unique, something which exists in its own right as a principle or ‘thing’ and which uniqueness of meaning has a context, with both context and uniqueness lost if a bland translation is attempted. Lost, as the uniqueness, and context, of for example, δαιμόνων becomes lost if simply translated as ‘spirits’ (or worse, as ‘gods’), or as the meaning of κακός in Hellenic culture is lost if mistranslated as ‘evil’. The foundation/base/essence of all beings [ ‘things’ ] is pyros to which they return, with all [of them] by genesis appropriately apportioned [separated into portions] to be bound together again by enantiodromia, and all filled/suffused/vivified with/by ψυχή and Dæmons. Personally, I incline toward the former, of some principle being meant, given the context, and the generalization – ἐκ πυρὸς τὰ πάντα. In respect of ψυχῶν καὶ δαιμόνων I would suggest that what is implied is the numinous, our apprehension of The Numen, and which numen is the source of ψυχή and the origin of Dæmons. For a δαίμων is not one of the pantheon of major Greek gods – θεοί – but another type of divinity (that is, another emanation of the numen; another manifestation of the numinous) who might be assigned by those numinous gods to bring good fortune or misfortune to human beings and/or who watch over certain human beings and especially over particular numinous (sacred) places. The foundation of all beings is Pyros to which they return, with all by genesis appropriately apportioned to be bound together again by enantiodromia, with all beings suffused with [are emanations of] the numen. In the philosophy of pathei-mathos (formerly The Numinous Way), enantiodromia is understood as the process – the natural change – that occurs or which can occur in a human being because of or following πάθει μάθος. For part of πάθει μάθος is a ‘confrontational contest’ – an interior battle – and an acceptance of the need to take part in this battle and ‘face the consequences’, one of which is learning the (often uncomfortable) truth about one’s own unbalanced, strife-causing, nature. 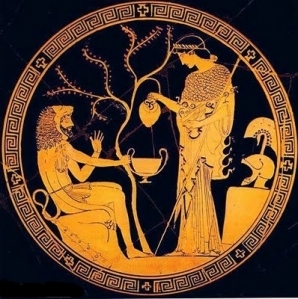 If successful in this confrontation, there is or there can be a positive, moral, development of the nature, the character – the φύσις (physis) – of the person because of that revealing and that appreciation (or re-appreciation) of the numinous whose genesis is this pathei-mathos, and which appreciation includes an awareness of why ὕβρις is an error (often the error) of unbalance, of disrespect, of a going beyond the due limits, and which ὕβρις is the genesis of the τύραννος and of the modern error of extremism. For the tyrannos and the extremist (and their extremisms) embody and give rise to and perpetuate ἔρις . Thus enantiodromia reveals the nature of, and restores in individuals, the natural balance necessary for ψυχή to flourish – which natural balance is δίκη as Δίκα  and which restoration of balance within the individual results in ἁρμονίη , manifest as ἁρμονίη is in the cultivation, in the individual, of wu-wei and σωφρονεῖν (a fair and balanced personal, individual, judgement). See my Some Notes on Πόλεμος and Δίκη in Heraclitus B80 and also The Balance of Physis – Notes on λόγος and ἀληθέα in Heraclitus. In respect of the numinous principle of Δίκα, refer to my short essay The Principle of Δίκα. Although φύσις has a natural tendency to become covered up (Φύσις κρύπτεσθαι φιλεῖ – concealment accompanies Physis) it can be uncovered through λόγος and πάθει μάθος. Attic Red Figure Vase c. 480 BCE, depicting Athena, in Antikensammlungen, Munich, Germany.